Collaboration between the team and with the client has become a main ingredient for good design, sparking creativity, and clarifying visions and understanding. When we bring all the parties involved in the design processes together, including the development, clients, stakeholders and final users, we can enhance creative outcomes and accelerate productivity. 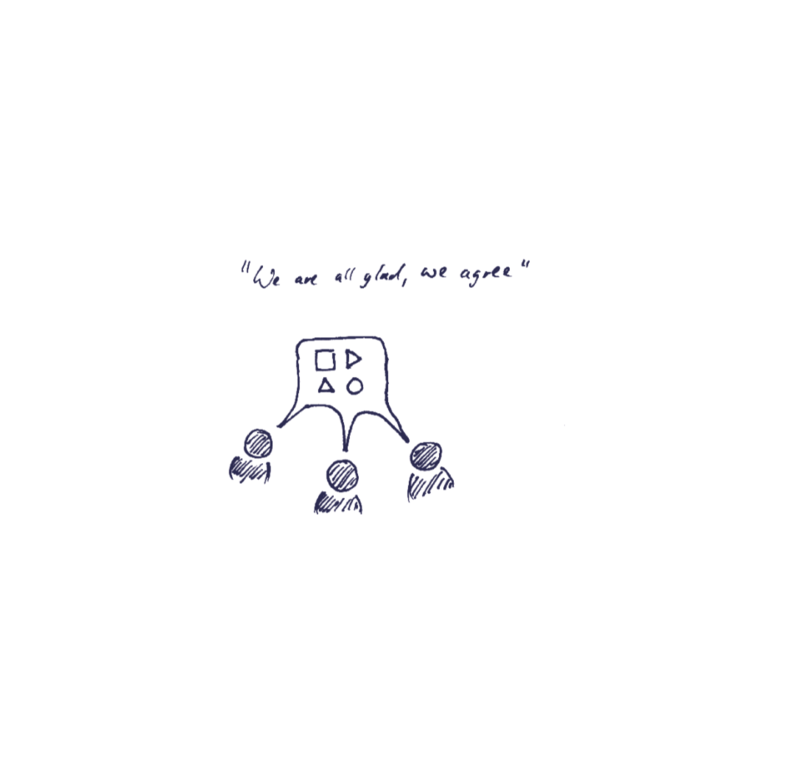 While collaboration is well established in physical environments, tools for design in the digital space often lack transparency or ways of connecting the work of different team members. In the practical part of my thesis, my research was conducted in the scope of how good collaboration in design succeeds and what factors like technologies, trends and tools have a direct impact on design execution. My research also involved field research to understand, what designing in collaboration means in different teams and companies. I wanted to understand what strategies and pain-points design teams have today. The insights are collected in the thesis you can find attached in the following. The practical part of my thesis focused on software collaboration and how it can blossom in teams. 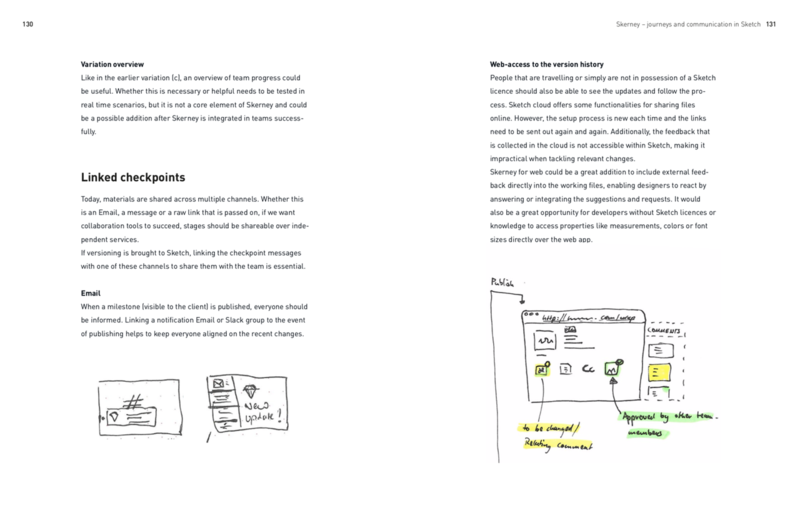 I developed a concept, Skerney, which focuses on file-journeys and collaboration in Sketch. 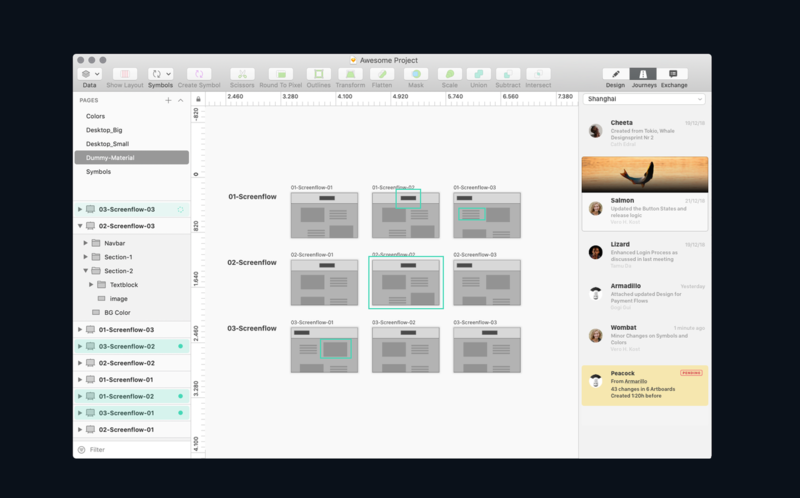 Skerney was designed as a concept to enhance collaboration and team communication when working together in Sketch. During the research I conducted, I found that current ways of managing, structuring and exchanging files within and outside the team do not suit the iterative and collaborative model that design processes have today. 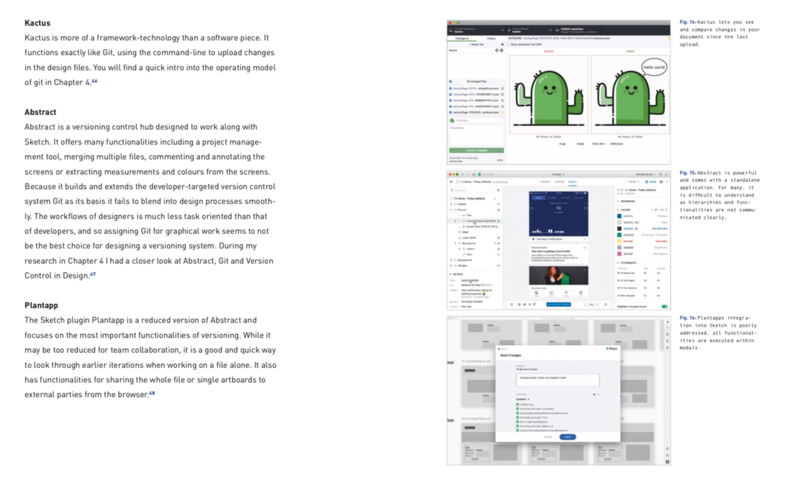 Sketch’s application structure and operational model builds upon archaic file structures, which forces teams to rethink and restructure their workflows in order to achieve good collaboration. For many teams this makes it difficult to work in collaboration without losing transparency and creative freedom. Imposed structures in the organisation of exchange and arrangement would often lead to rigid, structured work processes and systems, which can limit creative freedom and the free unfolding of thoughts. On the other hand, too few structures can lead to a lack of transparency and too little insight into each other’s progress, which often results in redundant or asynchronous work. Too little transparency produces isolation in teams, slowing down processes and decreasing motivation. My concept derived from the need for transparency between team members working in Sketch by adjusting versioning for their needs. To get a better understanding of how teams collaborate and what software and tools they use to organise their daily workflows, I conducted interviews across different fields. In this context, I also wanted to collect feedback for the ideas I developed over the first concept phase. During my field research, I interviewed people from MING Labs, Nexenio, the Technology Foundation in Berlin, Microsoft Research Lab Berlin and Framer as well as Freelancers. In addition, I collected Cultural Probes and participated in various meet-ups around the field of collaborative design. 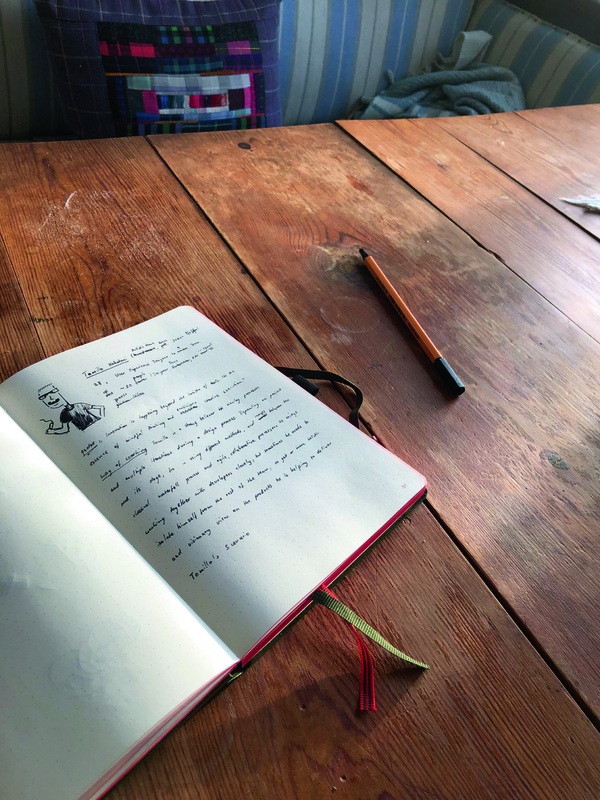 The insight evolved around the fields of communication, transparency, openness, structures and tools and can be found in the fourth chapter of my thesis. 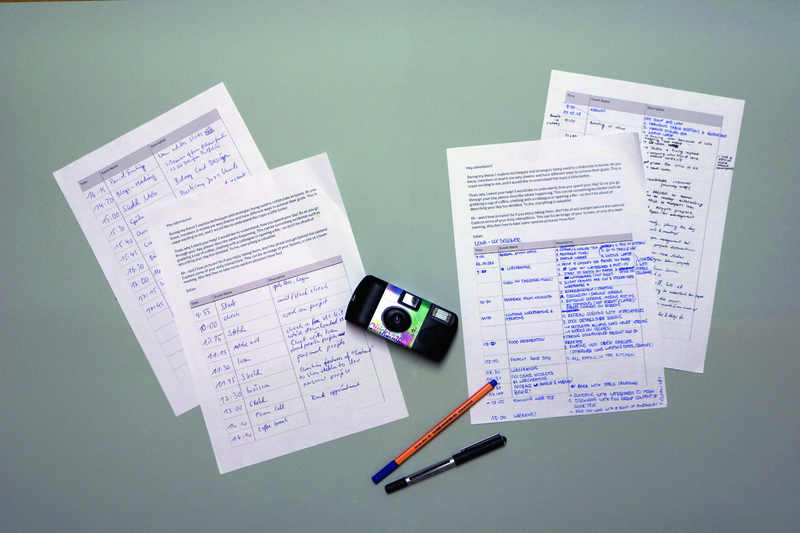 Logbook and disposable camera: Cultural Probes are a good way to understand workflows of individuals and teams. As described in the third Chapter Utilities, software should be seen as just one of many choices of tools for the execution of a design process. The Dutch graphic designer Wim Crouwel once said “You can’t do better design with a computer, but you can speed up your work enormously”, describing the influence of the growing computer industry on design. I think the same applies to the use of the right software today, making the choice of software a significant but not decisive factor in the quality of design. Good software can enhance speed as well as graphical and interactive depiction when it comes to the realisation of concepts and ideas. It can drive but not produce good design. To enable teams’ full potential, I wanted to explore ways of enhancing digital collaborative work. 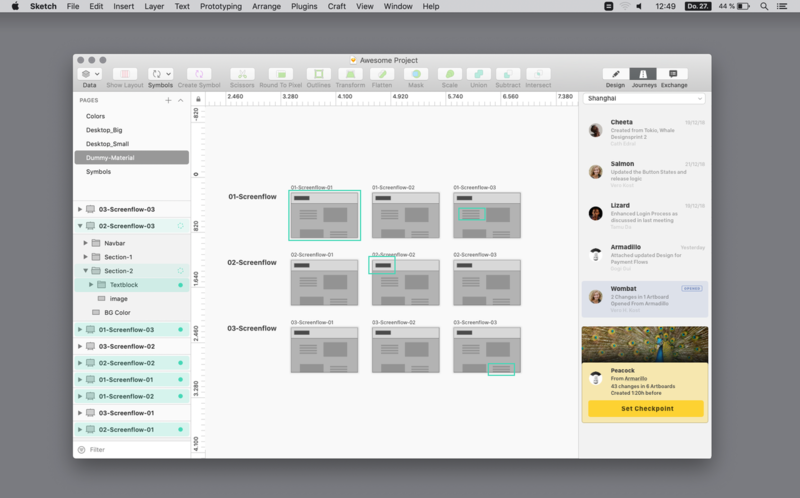 During the interviews, thoughts of enriching Sketch with communication and versioning features were consolidated. 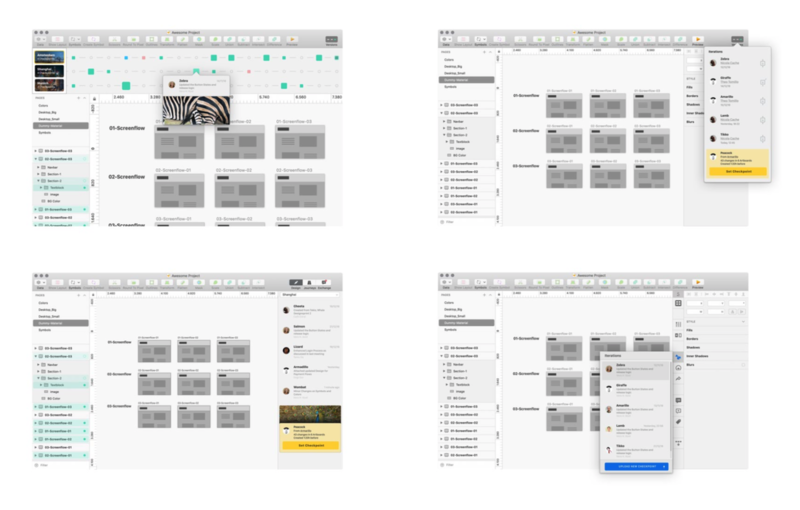 My field research had confirmed the need for more transparency and communicational layers within Sketch and I was excited to start with design. When I was working for MING Labs Singapore in 2017, me and a colleague worked together closely on a design blog. We were trying out different layouts and variations in styles, iterating openly. That was about the time when Abstract for Sketch arrived on the market, promoting itself as a versioning tool to allow better team collaboration. We were excited to test it in the small frame of the project, thinking it might improve teamwork for future projects. However, my colleague was confused about the operating model of the tool and I comprehended her confusion. The external tool was a close copy of the neighbouring versioning-technology Git, which has been used in development for over a decade. The Git approach is ambiguous and leaving the operating model unexplained makes it difficult and complex to comprehend for people outside the development field. For betterment in transparency, Skerney should enrich the experience of Sketch with the addition of a versioning system for managing iterations and variations. Files should become globally connected while retaining their private environment of work. The user should be able to make checkpoints any time, documenting their work progress and being able to share it with their teammates. The goal was to strengthen experimental but reflective ways of working and making the work progress accessible for different parties involved in the process. With its transparency and communication features, it should drive an active feedback culture in teams across all its involved instances including developers, clients, project managers and other relevant stakeholders and members of the team. Skerney should integrate seamlessly and coherently into the existing tool to enrich instead of disturb existing workflows. When browsing through certain iterations, changes from the last version should be detected easily and highlighted on various touchpoint. 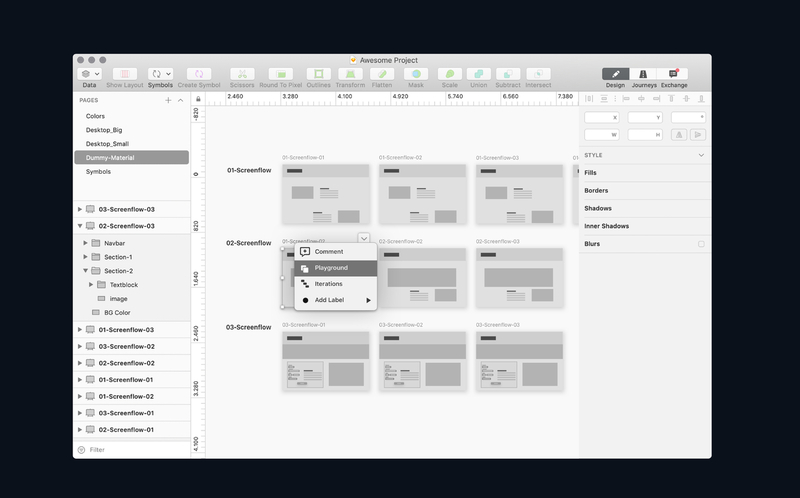 I visualised different variations to integrate versioning and my other concepts into Sketch. 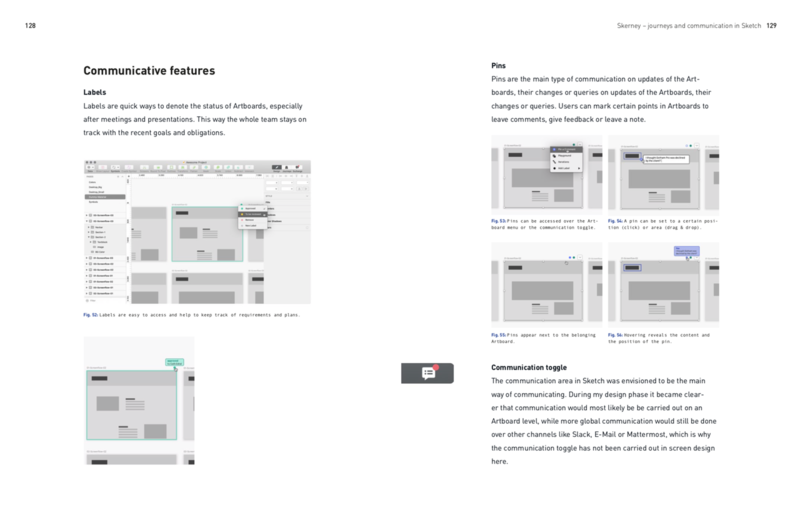 The different approaches were shared with other designers over InVision to collect feedback. My concept derived from the need for transparency between team members working in Sketch by adjusting versioning for their needs. During the integration of versioning into Sketch, I examined the topics structures, communication, safety and control, and fun. Structures are essential in the workplace. They drive productivity, help workers to envision goals, and reduce complexity for repetitive tasks. However, too many structures can harm creativity by reducing the creative freedom users have when using a tool. Skerney was designed with the intention of having as few functionalities and features as possible. The functionalities of existing versioning tools were simplified and broken down into the two dimensions iterations and variations that are described using animals and cities. Functionalities and features are integrated seamlessly and with the aim of being accessible where they are truly needed. Changes and updates in checkpoints, statuses or pins are visualised on the dependent element (Artboard or folder) and strive for an easy to use and self-explanatory appearance. Communication in design is essential, ensuring clarity on the scope and challenges of a project and kindling the creative spark. All communication in Skerney was designed with an awareness that most team communication takes place on existing messaging platforms. Skerney’s communication features, such as pinning a question to a specific area of an Artboard or describing your checkpoint, try to enrich existing communication by creating connections and supplementing other communication channels, reducing complexity and time expenses to a minimum. The interviews show that the standard of files are strongly embedded into the mindset of people which will make it an effort for them to switch to a different mental model. Files give users a sense of possession and ensure privacy. When designers work on projects, they often alternate between isolation and collaboration, giving them the room to explore more freely. Creative tensions are necessary for good results, and require team members to reflect upon themselves and the project, experimenting with their own set of possibilities freely. Skerney’s checkpoints were designed for use during different stages of design, allowing users to set checkpoints as private (checkpoint), making them visible to the team (lookout), or to share them with external parties like the client (milestone). Checkpoints were designed with close attention to a clear structure, communicating the functionalities openly and clearly to convey control and trustworthiness. In my experience, the biggest impact on efficiency and creative outcomes is fun. Whenever teams manage to bring in joy into creative processes, you can be sure that it will be visible in the results. Enjoyment of projects produces better ideas, greater communication and more overall momentum. Integrating fun into software is impossible to control because fun is something very personal, especially when it comes to different constellations in teams. However, when we use software that seamlessly matches our needs, doesn’t offer too many functionalities and stays rather simplistic, it can fill us with joy. Skerney tries to be self-explanatory and supportive by including features like animals in iterations making it comfortable and rewarding to use, driving exchange, increasing transparency and presenting users with a better overview of the overall progress of a project. Playgrounds function as an additional layer of collaborative work, strengthening variation and experimentation across the team. Due to limited time and workforce, Skerney has only undergone a few iterations and was only tested with a small base of users. The developed concepts are based on assumptions concluded from my research, and would need further testing and improvement if the tool is ever to be used in the daily life of designers. In that context, it would also be necessary to take functionalities like versioning into development, to see how they perform in action. Because most of the features in Skerney aim to integrate themselves deeply into the daily workflow of designers and Sketch, they can only be tested in real-life scenarios, finding out iteratively how the new ways of sharing work truly implement themselves and whether their effect on collaboration and communication is as we would expect it to be. I believe that the result of my work is a creative vector that points in the direction of good software collaboration design, but that would need further adjustments as the product would evolve. 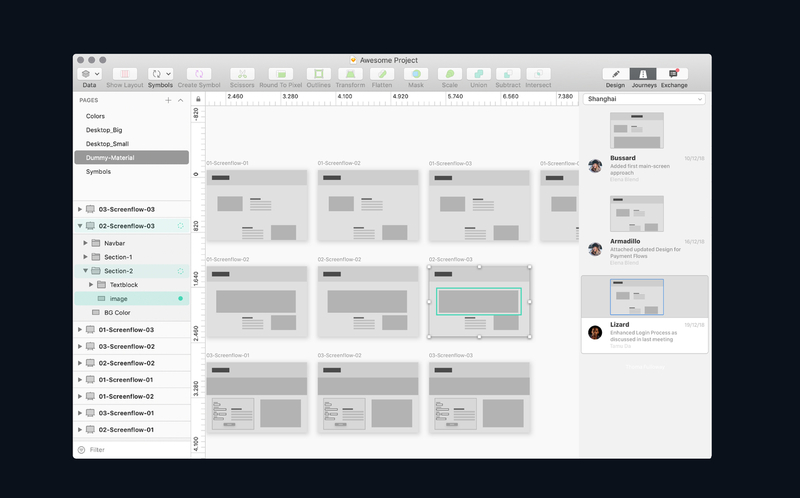 Looking at it from a product perspective, it could be the first big iteration of many and could function as a stepping stone on the way to better collaboration in the development of Sketch. 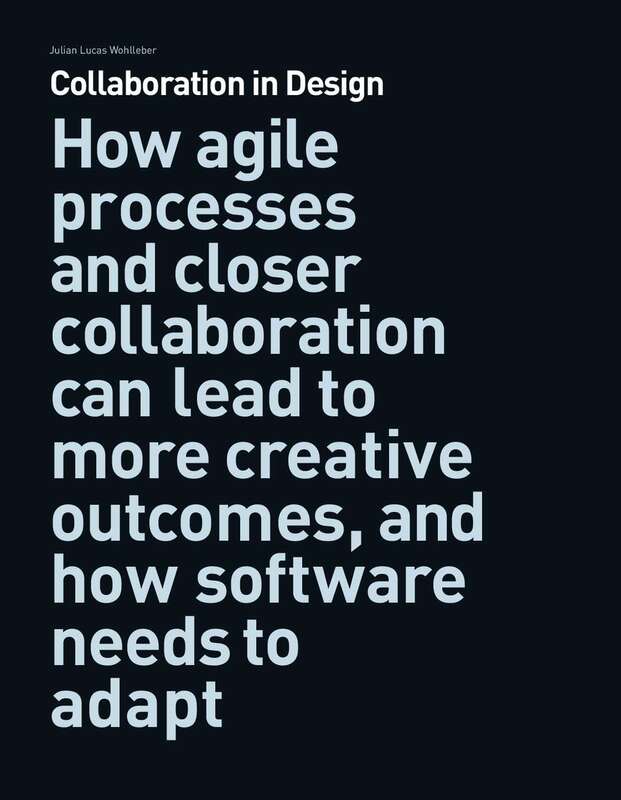 However it should not be forgotten that software is only a small part of the process of design, and the mindset, attitude and capability for empathy of its human counterpart has a much more decisive effect on the outcome of collaboration in teams.